This one-volume narrative history of American Indians in the United States traces the experiences of indigenous peoples from early colonial times to the present day. It demonstrates how Indian existence has varied and changed throughout our nation's history. Although popular opinion and standard histories often depict tribal peoples as victims of US aggression, that is only a part of their story. 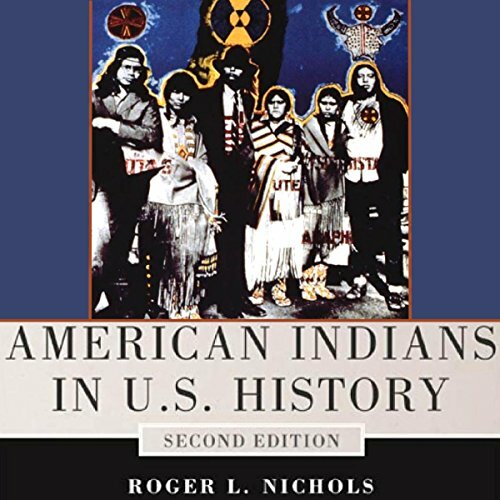 In American Indians in US History, Roger L. Nichols focuses on the ideas, beliefs, and actions of American Indian individuals and tribes, showing them to be significant agents in their own history. Offering listeners insight into broad national historical patterns, it explores the wide variety of tribes and relates many fascinating stories of individual and tribal determination, resilience, and long-term success. Charting Indian history in roughly chronological chapters, Nichols presents the central issues tribal leaders faced during each era and demonstrates that, despite their frequently changing status, American Indians have maintained their cultures, identities, and many of their traditions. Far from vanishing or disappearing into the melting pot, American Indians have struggled for sovereignty and are today a larger, stronger part of the US population than they have been in several centuries. Would you listen to American Indians in U.S. History again? Why? Yes, I would listen again. This book gives a great overview of the history of the American Indian in post-European immigration mainland U.S.
What was one of the most memorable moments of American Indians in U.S. History? There were too many to count, but I was very pleased to listen to the recent history of various groups. Have you listened to any of Todd Curless’s other performances before? How does this one compare? No, I have not listened to Todd Curless read for Audible before. I enjoyed listening to his voice--it was pleasant without distracting from the information. There were a few times where he injected a humorous or wry tone and I found these spots of emotional expression very appropriate and they drew me in more fully to the story of the moment. His pace was very good for a listener who is studying the information in the book. I was reading for pleasure, though, so I listened to most of it a 2x, which was still a good pace (although not as good for taking notes). Based on listening to this book, I decided to purchase an Audible membership and have since done so. This is an exelent book for anyone who is interested in U.S history that was never taught in schools, information that will blow your mind about Native Americans and make you question the United States government.